#1 New York Times bestselling author Tory Johnson is a weekly contributor on ABC’s Good Morning America and Good Morning America Day. She leads the both show’s popular weekly “Deals & Steals” segments. A successful entrepreneur, Tory has helped women over the past two decades take charge of their lives personally and professionally. In 1999, she launched Women For Hire, the first-ever career expos for women, which helped thousands of people secure jobs with top employers. She also ran events and consulting services for current and aspiring small business owners. 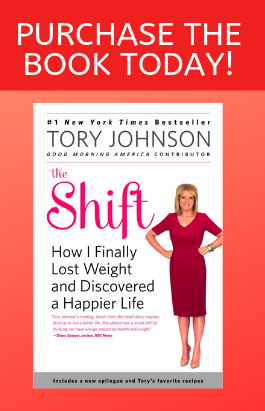 Tory’s #1 New York Times bestseller, The Shift, chronicles her journey toward a healthier life. Overweight her whole life, one candid conversation with her TV boss led Tory to lose more than 60 pounds in a year. Her candid story has inspired women everywhere to do the same. Tory addresses diverse audiences every year. In her smart, funny, candid and insightful speeches, she celebrates life, love, family, work and the simple successes that are at the root of our happiness. She reminds us that we all have exactly what it takes to get what we want—when we give ourselves the time and discipline to pursue our goals. A married mother of college twins with more than 100,000 fans, friends and followers on social media platforms, Tory has spoken for women’s conferences in Massachusetts, Pennsylvania, California and Texas, and at health conferences and many association and business conferences around the country. Her unique weekly TV presence and career development and weight loss experiences make her an ideal messenger to motivate audiences to make their own powerful shifts in all aspects of their lives. MAJOR CONFERENCES: Texas Conference for Women, Massachusetts Conference for Women, Pennsylvania Conference for Women, Nerium, Maryland Bankers Association. PartyLite National Convention and assorted regional training sessions, Gold Canyon National Convention, Nature’s Sunshine National Convention, PMPI regional events, Direct Selling Association National Convention, Maria Shriver’s California Women’s Conference and so much more. To inquire about booking Tory as a speaker for your next event, please submit an email to us here with details about your program, audience, date, goals and expectations.